In the previous post I mentioned that I placed the order for my first mechanical keyboard. It arrived a day earlier than the seller predicted. The postman was kind enough to deliver it to me just before I left for work. But I had to rush to work, so I decided to play with it when I returned home from work. 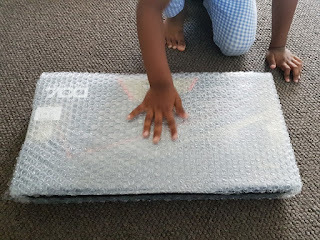 I unboxed the keyboard with my son sitting along side. It was way more fun for him than myself. I am not that amused by unmoving packages; I just want to to get it working asap. But I took some photos just to post here. The keyboard has two USB ports. I think you can do with just one, because the second one is just for USB passthrough. But I connected both because I have ample USB ports on my PC. To test the keyboard, I opened up notepad and started typing some words. I noticed that the spaces weren't registering between them. I hit the space bar several times and I wasn't dreaming: the spaces really weren't registering. I disconnected the keyboard and reconnected it to see if it was just a random Windows error. But the space bar still wasn't working. I connected the keyboard to two different ports on the back as well as the front. Same story. Then I tried it on the MacBook Air, and no change. The space bar was not working!!! The keyboard doesn't have a companion software. That was one reason why I was happy to buy this keyboard in the first place. An additional software layer means more input lag. So this wasn't caused by me forgetting to install a companion software. I went through the manual to see if I was doing something wrong. Honestly, what more should one do to get a keyboard working with a PC? Anyways, the manual did not mention anything special we had to do, nor any troubleshooting guides, so it wasn't a setup issue. Conclusion: the keyboard was a DOA!!! I have not had a DOA in a long time. The last one was a MSI GTX 970 Gaming 4G which had one of its fans not working, but it wasn't totally DOA. I wanted to see if the space bar was the only key that was not working. It was not. Several keys were not registering the key strokes. Namely, the Delete, down cursor, Num Lock, Num7, Num4 and Num1 weren't working. If I had to guess, all these keys were connected through the same electrical wiring to the controller. I uploaded a video to YouTube showing the fault. I went online to see if there were similar claims, but it seems I was the only (un)lucky one. It was time to RMA the keyboard. I first messaged the store through eBay. I was told that they would most probably have to refund due to stock being exhausted. I asked how to proceed with it, but I did not received a reply back. It was late night anyways. I was lucky to have received the initial response in the first place. Next morning, I called the store and explained the situation. I was told that since I bought the keyboard through eBay, the refunding has to happen through eBay. I had to wait for the reply to my questions on eBay. The same day I wrote a reply to the thread on ozbargain which originally mentioned about the deal about my situation. Luckily a store rep was monitoring the thread there and responded to me. I showed them the video I uploaded to YouTube and he said since that footage was good enough proof that the keyboard was defective, he provided me instructions on how to return the keyboard. 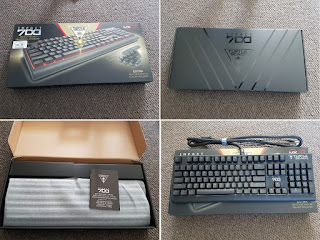 I told him what the person at the store told me about the RMA needing to go through eBay, but he told me that the refunding will be through eBay, but it was OK for me to return the keyboard by post now. I asked if I had to pay the return postage and he said they will absorb the loss and gave me a return postage paid link to Australia Post to arrange it. For them, they can claim "the loss" on tax anyways. Not for us. The next day, I packed the keyboard and posted it back to the shop. I messaged them that I posted it and they replied back to me saying that they will confirm it when they receive the package. I got a tracking number and I added it to the Australia Post's Android app and I kept monitoring the status of the package. Next Monday the package was delivered to the store but I didn't hear from them, so I messaged them on Tuesday morning asking about the status of the RMA. I was messaged back saying that they have contacted the distributor along with my footage of the problem and the refunding shouldn't take too long because of that proof. They were true to their word and I got a refund through PayPal in a couple of hours. I transferred the PayPal money to my bank account and the money was credited to my account the next day. So... the mechanical keyboard dream was shattered.